Learning How to Deal With Traffic light Junction! Whilst learning to drive, you will come across many traffic lights. The UK traffic lights sequence explained here is an essential part of learning to drive and the theory test. Although understanding traffic the light sequences is reasonably simple, greater challenges often arise when dealing with other road users and pedestrians at traffic lights. It is of course important to obey traffic light signals, but equally important to have a constant awareness of what is around you.Cyclists and pedestrians in particular can be unpredictable around busy light controlled junctions. This guide provides information on traffic lights sequences at various systems found on UK roads, along with an explanation on filter lights and the rules and legal regulations that must be complied with at traffic lights. Uk Traffic Lights Sequence Explained! A vehicle must stop just behind the white stop line at traffic light. Also means stop but can prepare to go. A vehicle must not pass through the lights until the green light is illuminated. When the light turns green, you may proceed providing the way is clear. When a single amber light is illuminated, you must prepare to stop just before the first white line. You may only proceed through an amber is you have just crossed the stop line as it changes or are too close to the stop line that stopping may cause an accident. 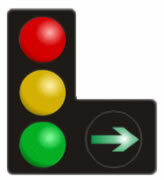 A green traffic filter light allows traffic to proceed in the direction of the arrow. A directional green filter arrow means that you have priority over traffic as their lights will be on red when you make the turn. As with all junctions be aware of pedestrians and cyclists whilst making the turn. Just because you have priority, there is a possibility of another vehicle, cyclist or pedestrian crossing or being where they shouldn’t be. It is also relatively common for a learner driver to focus primarily on the red light and not notice the green filter light is illuminated allowing you to proceed. During a driving test, if you have not acknowledged the green filter light for a period of time or the examiner even makes you aware of the illuminated filter, it’s likely to fail your driving test. A filter light may illuminate before or after the full green phase. Ensure you keep an eye on the filter light as well as the main phase lights. Traffic filter lights can be located anywhere including box junctions. 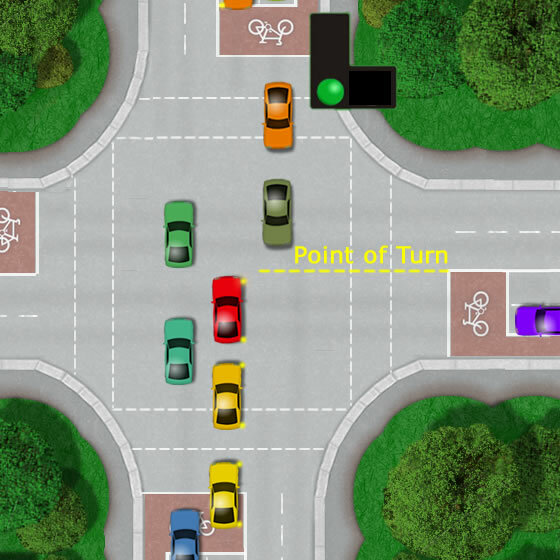 Be highly aware if a yellow box junction is present. If a green filter light is illuminated you may only proceed if your exit is clear and you must not stop on the yellow box. See Box Junction for further information. 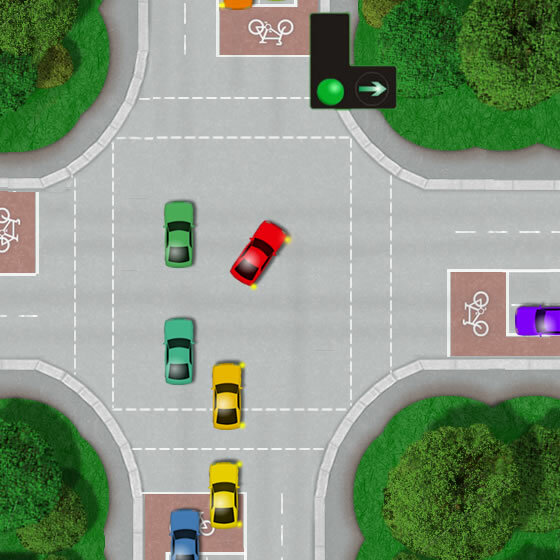 Below follows the rules of the red car turning right at a crossroads where a filter traffic light is directing traffic. Green filter light not illuminated! If turning right and your green filter light is not illuminated or it distinguishes, you can still proceed providing the full phase green light is illuminated. You must however give way to oncoming vehicles and wait at the point of turn. (Image can be enlarged). All traffic lights have a stop line. Advanced stop lines such as the images above allow for cyclists to stop ahead of other vehicles in a bay often in a alternative colour to the road. All traffic must stop at the first line when the lights are red and avoid entering the cycle bay when stationary. Traffic jams and slow moving traffic at light controlled junctions often results in frustration for many drivers, particularly when junctions are blocked when your light is green. Technically it’s not illegal to block a junction unless prohibitions are in force such as the yellow box. Other advisory notices such as ‘Keep Clear‘ road markings may also be in place. However, blocking a junction impedes traffic flow, so only enter it when you are certain you can clear it – even if your light is green. 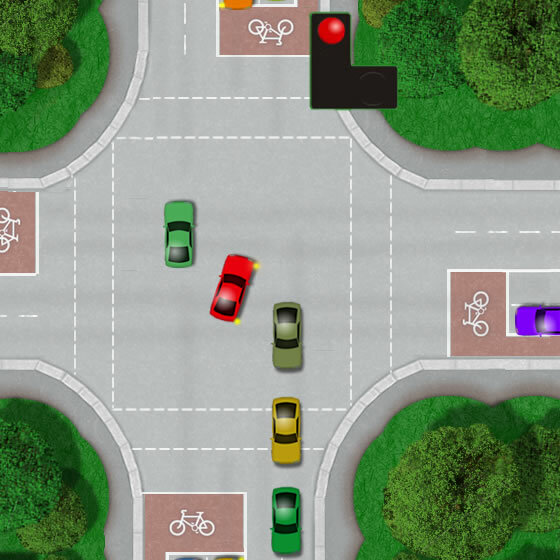 During a driving test, dealing with traffic lights will require a similar technique to dealing with junctions. The M,S,P,S,L (Mirror, Signal, Position, Speed and Look) routine must be applied. A good level of anticipation and planning is also required. For instance, if approaching traffic lights and from a distance they have been on green for some time, as you approach, expect there is a high probability they may change and prepare for this in advance. Also traffic lights at pedestrian crossings for instance, if in the distance you see people waiting, as you approach there is a high probability the lights will change. Pedestrian Crossing Traffic Lights Sequence! All light controlled pedestrian crossings use the same light sequence as the traffic light sequence detailed above with the exception of the Pelican crossing. Where the Pelican crossing differentiates is with the flashing amber phase. The flashing amber allows vehicles to proceed only if the crossing is clear and safe to continue. The newer more efficient Puffin crossing is gradually replacing the older Pelican crossings. See pedestrian crossing for further information on the types of crossing and light sequences. It’s important when approaching traffic lights to be prepared to stop if they change. Running a red light is obviously dangerous and on may traffic lights, cameras are now fitted. There are very few exemptions for running a red light and even a learner driver may find themselves with 3 penalty points on their provisional licence and a fine of £200. A red light camera can even be triggered if your vehicle stops only slightly over the white line. Of course, this would also result in a driving test failure. Dealing with a traffic light failure can be daunting for a learner driver. If you find yourself in this position, you must treat the junction or crossroads as unmarked. With an unmarked junction, nobody has priority. You must proceed slowly and with caution and only continue when safe to do so.